Resource Library > Customer Stories > Woodland/Alloy Casting Inc.
Woodland/Alloy Casting Inc. is a full-service aluminum casting provider, servicing numerous industries including aviation, electrical, industrial, marine and defense. Specializing in green sand molding, air set molding and permanent mold, Woodland/Alloy Casting has the capabilities and expertise to meet is customers’ casting needs ranging from parts weighing just a few ounces to 2000 lbs. Woodland/Alloy Casting prides itself on delivering quality aluminum castings “on time, every time.” With the convenience of being able to perform molding, core making, melting, heat treatment, cleaning and surface preparation all under one roof, Woodland/Alloy Casting is able to continuously satisfy those time and quality standards for its customers. While exploring ways to simulate solidification and streamline their casting process, Woodland/Alloy Casting discovered solidThinking’s casting simulation software, Altair Click2Cast. Woodland/Alloy Casting found that by employing this intuitive tool it was able to completely optimize and improve their casting process while continuing to maintain the goal of quality castings on time, every time. One of Woodland/Alloy Casting’s most recent projects was transitioning a marine exhaust housing part from a lost foam casting to a sand casting. With this material modification in mind, there were a number of factors to consider when manufacturing this new casting. “We wanted to produce a sound casting, while still keeping ingates and risers to a minimum, this would allow for the yield to remain low and help reduce the time needed to remove the rigging,” explains Andy Ceretto, Quality Control Manager of Woodland/Alloy Casting. In order to create this sand casting, a new gating system was designed that would feed the casting from the bottom flange and push the metal to the top of the casting. Once the updated design was finalized, Woodland/Alloy Casting tested the new gating system by running a simulation in Altair Click2Cast. 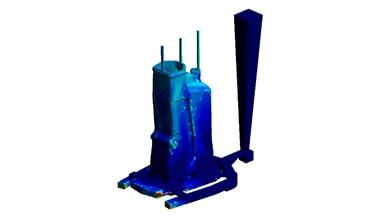 Woodland/Alloy Casting was able to conclude that the new gating system would produce a casting with zero defects. Before utilizing Altair Click2Cast, Woodland/Alloy Casting would have conducted numerous costly and time consuming tests, requiring a number of molds to determine the outcome of the new gating system. Ceretto states, “By employing Altair Click2Cast, we were able to conclude the new gating system would work properly after running just two simulations. Transitioning a marine exhaust housing part from a lost foam casting to a sand casting with an updated gating system while still maintaining a sound part. 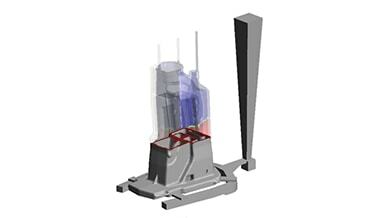 Employing Altair Click2Cast to run a casting simulation on the newly designed gating system of the exhaust housing. • The simulation ran in Altair Click2Cast produced results that confirmed the new gating design would be sufficient and provide a casting free of defects. • Reduced time in trial and error in creating numerous gating systems for numerous tests. 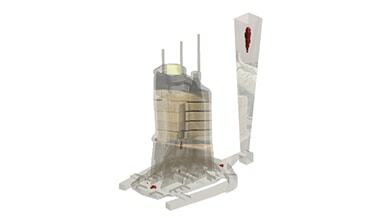 • Cost savings in eliminating the process of having to create new gating system samples and molds to test. Quality Control Manager, Woodland/Alloy Casting, Inc.
With the enhanced casting process in place, Woodland/Alloy Casting is continuing to see the benefits of both cost and time savings due to the simulation capabilities that are offered in Altair Click2Cast. Woodland/Alloy Casting has employed Altair Click2Cast on a number of casting projects since first discovering the software last year and is continuing to explore all the features, settings and tools that the software provides. Visualization in Click2Cast of shrinkage porosity in the exhaust housing part. Solid fraction during filling in Click2Cast. Woodland/Alloy Casting Inc. is a family owned business that was founded in 1986 with its headquarters located in Racine, Wisconsin, USA. With a growing reputation for quality aluminum castings, Woodland/Alloy has become a leader in the aluminum industry, providing numerous casting services to a wide variety of industries across the globe.